The black and orange color scheme that once defined the month of October has enthusiastically shifted to a brilliant rainbow of pink hues in celebration of Breast Cancer Awareness Month. Awareness is everywhere in the public and private sphere, from NFL games to Walmart. Over 230,000 women (and men) are diagnosed with the disease each year and the month has become dedicated to strengthening fighters, honoring victors, and spreading the word on the importance of early detection exams. Incidences of breast cancer have been on the decline since 1990 but the statistics for African American women remain startling. Although breast cancer diagnoses are highest in non-Hispanic white women, African American women are more likely to succumb to the disease. Additionally, family history is no longer a determining factor. Nearly 85% of women who develop breast cancer do not have a history of the disease in their families. One of the most impactful methods in spreading awareness is through the telling of stories. Storytelling has been a primary means of communicating morals, values, and lessons in cultures for centuries. Even the most beautiful illustrations of faith, redemption, and love were through the telling of parables. October is a sacred time for women affected by breast cancer to share their testimonies and urge their fellow sisters to be diligent and take care of themselves. When a space is created for this purpose the result can be touching and transformative. 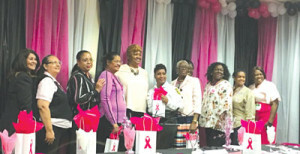 On October 26th, Broward County Clerk of Courts South Satellite location held a moving Breast Cancer Victory Luncheon in honor of breast cancer survivors. Although the event acknowledged those we lost, the focus was to educate and empower through testimonies. Survivors briefly and bravely recounted their stories, from diagnosis to chemotherapy, and shared their experiences fighting the disease. “I did not want to let this month go by without acknowledging some survivors even within our office.” said Janice Moore, Clerk of Court Satellite Manager. The wonderful event was heightened by an atmosphere of sisterhood and a sort of intimacy only women could tap into so well. Through many tears and smiles, the afternoon’s honorees laid bare their fears, insecurities, and triumphs and emphasized the keys to survival are prayer and early detection. Deputy ShaRonda Foster’s testimony set the tone for the afternoon as she tearfully described her challenges dealing with the physical battle scars of breast cancer. An advocate for early detection, Deputy Foster unfortunately lost her mother to the disease and found herself grappling with the choice to undergo breast removal. For months afterward, Deputy Foster admitted to feelings of insecurity and wore breast prostheses . A particularly moving moment came when she presented the prostheses her mother wore while she battled breast cancer. One simple theme weaved the testimonies together: faith. Survivors were quick to emphasize the power of prayer and to highlight to everyone that breast cancer is not something one goes through alone. It affects everyone around you. Survivor Ethylyn Satchell recounted a time when the women of her church laid hands on her after she was told her cancer had returned. Spaces where women come together and share are always otherworldly. There’s something magical about it. The event, attended by a rainbow of women from different cultures and backgrounds demonstrated that disease knows no race and that genuine love and support transcends manmade boundaries.